The quality of this budget cap will really impress you and it's embroidered with 7000 stitches using up to 7 thread colors. 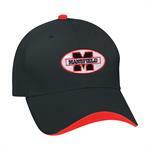 It is 100% cotton twill and has 6 panels and a medium profile. Prices range from $4.89 to $4.07 each. 100% Brushed cotton twill cap has 6 panels and a medium profile. Complimenting color wave and button give these caps a more stylish look. Prices range from $4.99 to $4.15 each. The quality of this budget cap will really impress you and it's embroidered with 7000 stitches using up to 7 thread colors. 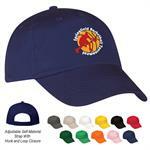 It is 100% cotton twill and has 5 panels and a medium profile. Prices range from $2.99 to $2.69 each. The quality of this budget cap will really impress you and it's silk-screened on the front with one stock imprint color. 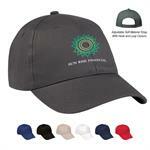 It is 100% cotton twill and has 5 panels and a medium profile. Prices range from $2.89 to $2.55 each.